You Might Be A Pict If…. …if what Dr. Jim Wilson, announced via press release instead of the more standard academic publication, is true. 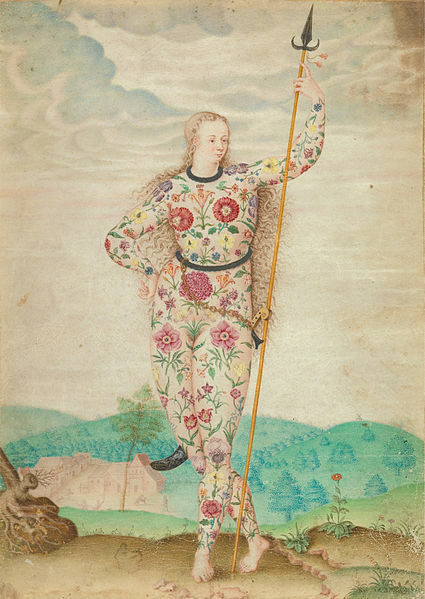 “A Young Daughter of the Picts” attributed to Jacques le Moyne de Morgues, circa 1585. The Picts were Scotland’s earliest known people. It’s unknown what the Picts called themselves, but the Roman’s gave them the name Picts, meaning “painted ones.” They were Celts, but their early history in the British Isles is unclear. By the time they entered recorded history, they were in Scotland, north of the Forth and Clyde, beyond the stronghold of the Roman empire with whom they fought bitterly on their borders. Their kingdoms in about 800 and 900 CE are shown on the map below. 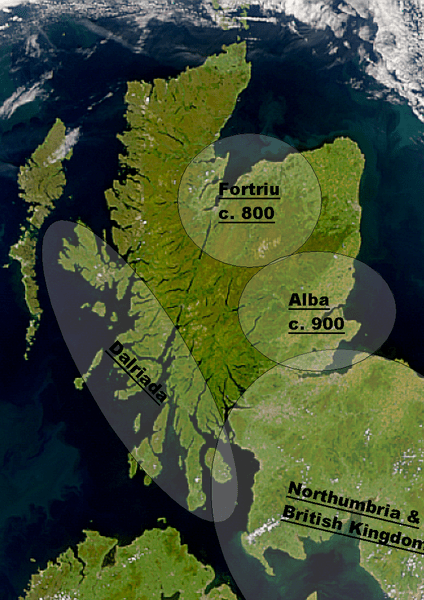 Eventually, in about the 1100s, and rather gradually, the Picts disappeared from the records as a separate people, having assimilated as fully Gaelic Scots, their Pictish heritage forgotten, into the mainstream of the British Isles, along with other Celts, Angles, Saxons and Vikings. Dr. Wilson says that S530, the newly discovered Pictish marker parallels the Pictish locations, in Fife, Perthshire, Tayside and the Northeast and around Moray Firth coastlands. Normally, this kind of an announcement would be met with an extremely positive reaction in the genetic genealogy community, but in this case, not so much. It seems that Dr. Wilson along with Britain’s DNA and Scotland’s DNA have been involved in some less than reputable actions recently, and one has to wonder if this is legitimate. By legitimate, I mean whether, if provided with the same data and opportunities, another independent academic researcher could reproduce the same results and if unbiased, would come to the same conclusions. This, of course, is part of the purpose of peer review during the academic publication process. This isn’t the first time this has happened, either. For more information about these companies, their issues, their scientific announcements via the media and resulting scuttlebutt, check the following links. Be sure to read the comments by Debbie Kennett on the link above, and the article below, on Debbie’s blog. I checked the Scotland’s DNA website, and fully expected to find a new “Pict” test, but it’s not there yet. Unless I’m terribly off the mark, I’m betting it will be soon, which might have something to do with circumventing the academic publication process, aside from the minor details of peer review and accuracy. Academic publication takes about 18 months to write the paper and shepherd it through the peer review process. Not trivial, and there is no “big splash” so to speak about an academic paper appearing in a little known scientific journal. Much bigger splash this way and one can offer a product immediately, no waiting. The problem is that science isn’t a “trust me” type of field and this type of science-in-the-media announcement with no documentation flies against all of the safeguards built into the scientific publication process. However, if you’re dying to know, and can’t wait, I have a hint for you, this SNP was discovered earlier this year, at Family Tree DNA. It’s also called SNP L1335, and is equivalent to S530. Kind of sheds a different light on the big announcement doesn’t it. If you need to know, and you’re a haplogroup R1b male, just order this SNP for $39 from Family Tree DNA and you’ll know if you carry this marker, or not. However, until Dr. Wilson publishes a paper and makes his data available for review, you won’t know if you are a Pict or just another L1335 Scottish male. This entry was posted in Picts, Scotland's DNA, SNP (Single Nucleotide Polymorphism), Y DNA and tagged General Information by Roberta Estes. Bookmark the permalink. Thanks for discussing this aspect of the R1b-L21 subclade, the so-called Scots Modal. This has been discussed on several forums and indeed is controversial. There is an L1335 Project on FTDNA and the R-L21+ project lists L1335 and the downstream SNP L1065 groups. It seems there is a small Welch group that tests positive for L1335, but negative for L1065. Well, here we go again with the “distinguished geneticist of Edinburgh University.” This is the description used by a group who’s desperate to believe what they’re being told by Wilson because it agrees with their pre-conceived notions. Wilson appeals to (and possibly takes advantage of) those who look for evidence to back up what they want to believe – quite a different direction from scientific research. Thanks for pointing out this new development. I agree. I have been identified as L1335, but I show numerous DNA marker matches with O’Briens, O’Quinns, and O’Hearns who are South Irish or ” Irish Type III” . Just because ten percent of Scots men show the SNP S530 doesn’t mean they are Pictish. While I’m pretty sure I have Pictish ancestors, I’m quite skeptical about proving it! The really big hole in this theory that the Picts were the first Britains is that if their Haplogroup was R1b, they were among the third great wave of migration. The hunter gatherers were the first, and they were chiefly I2a. The neolithic farmers were second, and then the Proto-Indo-Europeans, the R1b group, came in and took over. Picts may have been R1b, but if they were, they weren’t first. Originally they were from Scotland territories but during wars against Rome, they were pushed into Britain. They won those wars in the 1st century and are responsible for Britain and Scotland retaining their territories against the Roman Empire. Much later, they were chased out of Britain. They tried to settle in Ireland, but were refused. Scotland agreed to take them back, with the agreement that their leaders would marrying Scotland leaders to prevent turf wars. They were mostly moved into the north eastern marshes until King Edward the 1st invaded. After that, most were killed or enslaved and sold on the slave trade, so as far as Northern Africa. Some made it to Coos county Ireland and settled. Others to England and to the Americas. I have been told all of my life that my family is Pict and that we come from the moors of north eastern Scotland and prior to that, Britain, but were chased out. I was also taught via verbal history, that it is because of the Picts that today’s Britain and Scotland retained their territories against the Roman Empire in Caledonia. My last name is Morey, which means “people of the Moors”. As far as I know, we are one of the only families to retain our original name. I am female and our family’s tradition is to refuse to give up our name even through marriage. Not everyone refuses, but many of us still refuse. I will never give up my name and I am married.